Stone Village has picked up the rights and fast tracked a script called "Lobo" that will have a three film arc! Production is set to begin October 15th and shoot in Rio De Janeiro. The script synopsis was provided by Variety and goes as follows, "a man receives a photo and letters from his mother's will, then heads to an isolated town in the Amazon to discover his roots. There, he discovers a near-extinct species of werewolves and his true identity, and he helps the werewolves wage a battle for survival." (Sweet! Werewolves are freakin badass!) Lobo is being financed independantly and has a $15 million dollar budget. Ezna Sands will direct the script written by Dikran Ornekian and Ryan Colluci, while Dylan Russell and Scott LaStaiti will serve as executive producers, and Scott Steindorff will produce. Enza Sands talked about why he was drawn to the film, "The stylized nature of the film is what drew me, because it's far less a monster movie than a Western in the mold of Sergio Leone's 'Once Upon a Time in America'....I have the opportunity to bring back to audience the kind of hero they had in the '70s, someone as dark and conflicted as the new James Bond or the Dark Knight. Our intention is to tell a single story over three films, and this first chapter is a guy who makes a massive revelation." Sands sounds like he definately has a vision, and he'd better with only a $15 million dollar budget! This film sounds to be pretty cool, and I for one, am definately looking forward to more to develop! Thoughts on Lobo? Does this sounds like a good trilogy? 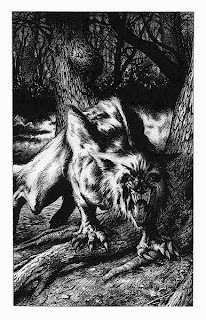 Are you a fan of werewolves?